You might assume that to get the cheapest deal on flights around the US, you simply travel during the winter, when fewer people are visiting. 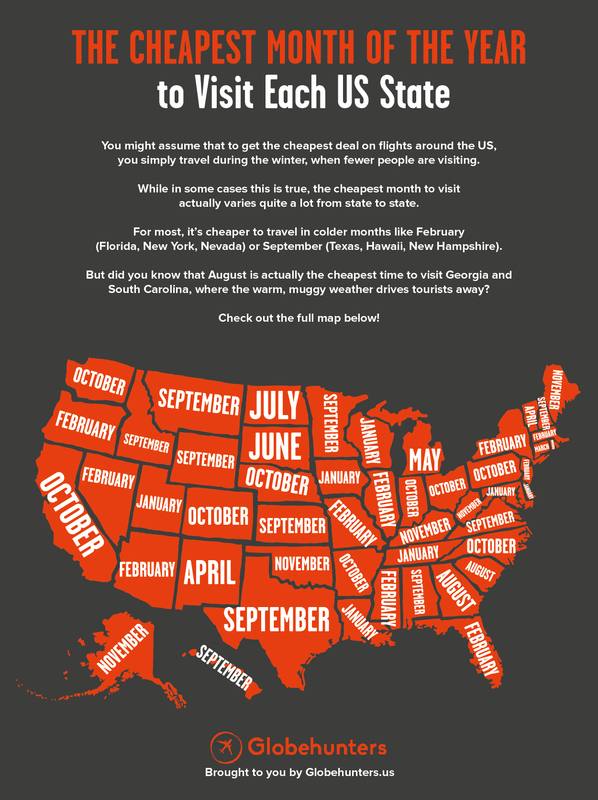 While in some cases this is true, the cheapest month to visit actually varies quite a lot from state to state. For most, it’s cheaper to travel in colder months like February (Florida, New York, Nevada) or September (Texas, Hawaii, New Hampshire). But did you know that August is actually the cheapest time to visit Georgia and South Carolina, where the warm, muggy weather drives tourists away? Check out the full map below! *Don't forget to check out our deals on cheap flights here at Globehunters, or get in touch with one of our travel consultants who will help you with your travel needs.